The darling buds of May are officially out, so why the snow and log cabin? 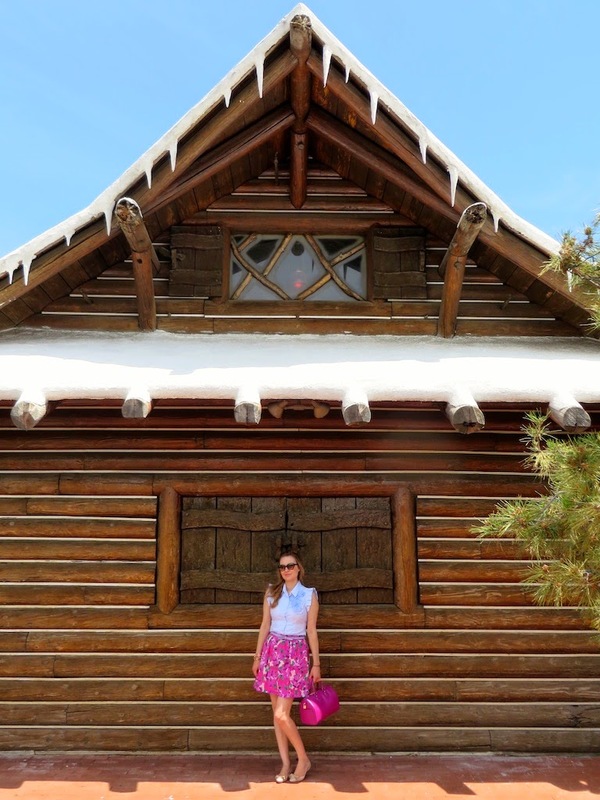 At Clearman's North Woods Inn restaurant it's winter in a log cabin all year round. The North Woods, which has a few locations scattered through L.A. and Orange County is one of my favorite restaurants, mostly due to their famous cheese bread, which is out of this world! As you can see, this place is a throwback to themed out restaurants of the 50s and 60s. North Woods' theme clearly evokes images of the Yukon Territory, complete with the rustic charm of a saloon where the likes of burly minors, lumberjacks and fur trappers might frequent to get a hearty meal and a beer or two. My ensemble was decidedly more summery than wintry with its floral motif; it is close to 100 degrees here after all! While taking these pictures a nice older gentlemen asked if he could take my photo with my husband. There's something about this restaurant; be it the waiters or customers, that takes you back to a kinder, simpler time. The inside of the North Woods Inn is dark, which I rather enjoy (it is a cabin after all! ), but not so great for taking photos. One of the most charming things about this place is that they give you a bowl of peanuts when you arrive. My husband's grandfather used to throw them at us in a playful manner. Today I observed at the table next to us that there was a grandpa doing the same thing with his grandson. I guess some things don't change. I love that you can just toss the peanut shells on the floor when you are done. Well, I highly recommend stopping in for a beer, some cheese bread and a sandwich or steak if you are ever in the L.A. area. 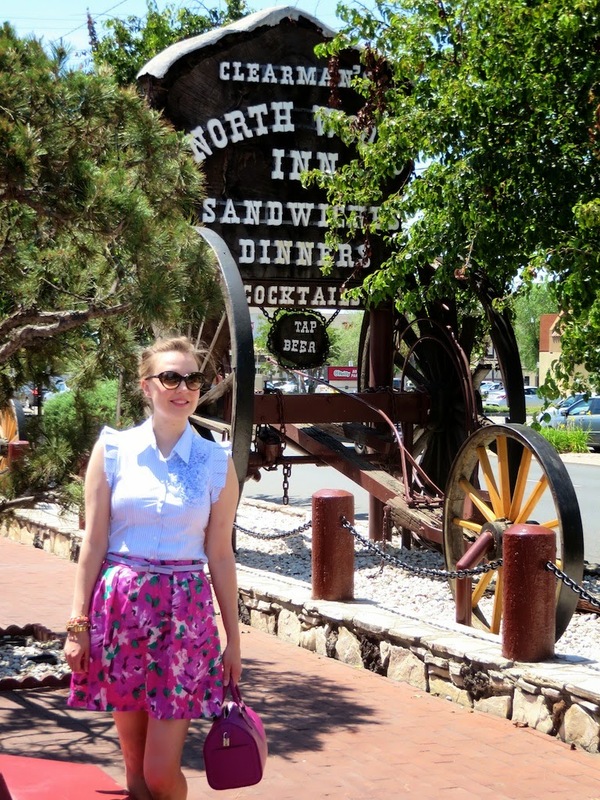 The North Woods Inn will take you back in time, not to mention offer up some great grub in an unusual atmosphere. Such a lovely outfit, Katie! And you totally had me with cheese bread! That shirt is fantastic, I love it! You, as always, look fab!